A company acquired by Google that develops robots for the U.S. military appears to have greatly reduced its dependence on government funding, suggesting a reluctance on Google’s part to align itself too closely with military projects. When Google acquired Boston Dynamics last December, some questioned whether the firm’s military focus conflicted with Google’s pledge of “don’t be evil” and the virtuous image it nurtures for itself. 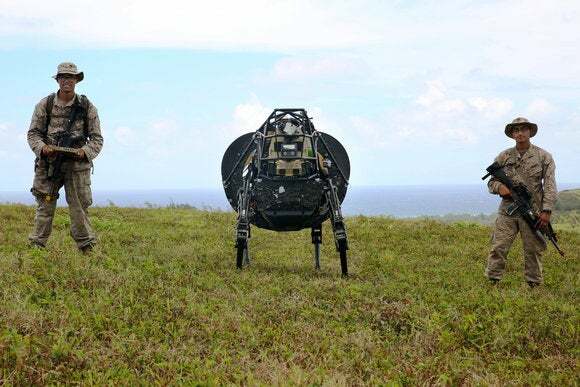 Google's LS-3 robot is put through its paces by Lance Cpl. Brandon Dieckmann, (left) and Pfc. Huberth Duarte of India Company, 3rd Battalion, 3rd Marine Regiment, U.S. Marines, at Kahuku Training Area on Oahu, Hawaii. But so far in 2014, Boston Dynamics has received just one payment, of $1.1 million, the records show. The money came from DARPA in April and was for participation in the organization’s robotics challenge, which aims to stimulate robot research and attracts teams from around the world. Lance Cpl. 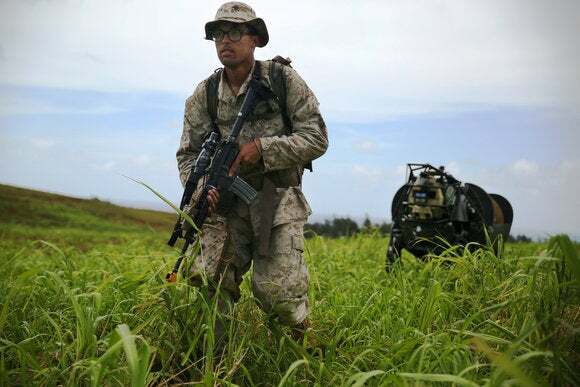 Brandon Dieckmann, infantryman with India Company, 3rd Battalion, 3rd Marine Regiment leads the LS-3 through a grassy area at Kahuku Training Area. It’s unclear why the funding has dropped so sharply, but it suggests a reluctance by Google to pursue military projects and align itself publicly with the U.S. government, especially when suspicion about clandestine government projects is running high. Lance Cpl. 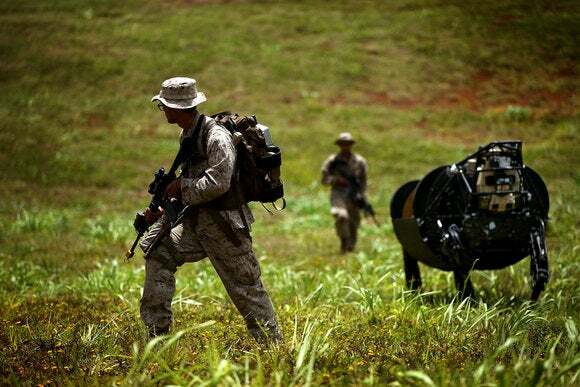 Brandon Dieckmann, infantryman with India Company, 3rd Battalion, 3rd Marine Regiment, and native of Las Vegas, maneuvers the LS-3 robot via the Tactical Remote Control (TRC) through a grassy area at Kahuku Training Area on Oahu, Hawaii. 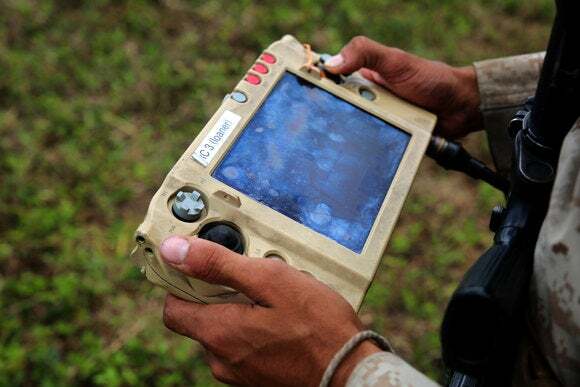 The LS-3’s role in battle was highlighted this week when U.S. Marines put the robot through its paces in a variety of terrains as part of the RIMPAC multinational naval exercise in Hawaii. Scott Strawn, an IDC analyst who follows Google closely, said its “don’t be evil” mantra is more a PR statement than a fixed rule for business, but it does reflect an awareness at Google that making money depends on maintaining the trust of its users. That can create tension when areas of its work overlap with government and military goals. “There are just inherent aspects of their business that are going to be very interesting from a defense perspective,” he said. While Google’s robot ambitions are unclear, it may have little interest in becoming a supplier to the military. In December, it said it would “honor existing military contracts,” but that it did not plan to become “a military contractor on its own,” according to a news report at the time. Instead, it’s believed to be interested in robots for use in factory automation, home help, package delivery and even as explorers on future space missions.